For Sean Pickett, it was supposed to be a fun night out with his girlfriend and friends in Hongdae, a popular nightlife district. That night, however, he faced discrimination at a major club because he looked “white,” he says. Pickett, whose mother is South Korean and whose father is a white American, was charged 20,000 won for being a “white man,” he said, even though Korean men were charged 15,000 won and Korean women were charged 10,000 won. “I felt so humiliated, insulted and ashamed of myself. Even if I tried to talk to them in Korean, it wouldn’t matter at all. They only see your skin color,” said the 25-year-old, who tried to enter the club at around 11 p.m. on March 29. Speaking as a biracial person who faced discrimination while growing up here, he said Korean society has gotten “much better” in terms of racial tolerance but there is still room for improvement. Club representatives denied the racism allegations, saying they barred only those who failed to follow the club’s rules whether they be foreigners or Koreans. Korea, one of the most homogenous countries in Asia, has seen a notable increase in the number of multicultural families in the past decade. As of end-December, 2.37 million foreign nationals reside in Korea, about 4.5 percent of this year’s estimated population of 51.7 million. A total of 15.3 million people traveled to Korea in 2018, with nearly 80 percent of them visiting Seoul. While complaints about racism and xenophobia continue, banning people from entering clubs based on race and nationality is not a general trend. A street in Hongdae, one of popular nightlife districts in western Seoul, is filled with people at around midnight on Saturday. A French national in his 30s also recalled his experience of being banned from entering clubs at Hongdae and Itaewon last year. “The security guards at the club in Hongdae said there was no way I could get in. He said, ‘No French people,’” he said. “It happened again in Itaewon last fall. They (the bouncers) first said I could not get in because I didn’t speak Korean. I said I spoke the language. And then they told me they do not accept white people because they make a lot of trouble. “I could understand why they came to this conclusion. But it is a blatant act of racism,” the 10-year resident of Korea said. “Maybe it is true that some white people must have made trouble, but that is no reason for me to be discriminated against just because I am white. “They wouldn’t allow me in because I have to buy a table. One table is really expensive. They continued to let people in. He just said that to me,” she said in the video, adding that other white and Asian people were accepted in without being asked to get a table. An Indian national, Kislay Kumar, was banned from entering a club in Itaewon in June 2017 because of his nationality. His friends from Russia, Colombia, Afghanistan, Canada and France were allowed in. Prohibiting people from entering restaurants, bars and clubs on the basis of how they look constitutes racism, experts said. “We have received several complaints from foreigners that they were banned from certain restaurants and bars. It constitutes racism if a person is discriminated against due to skin color and nationality,” said an official from the National Human Rights Commission of Korea. Currently, there is no law to punish acts of racism. The only way to address the issue is to file a complaint with the NHRCK. Upon receiving a complaint, the agency opens investigations and makes due recommendations, which are not legally binding. “The government cannot fully intervene in commercial facilities, but it still has our responsibility to monitor acts of racism and improve awareness on the issue,” she said. Representatives of the clubs accused of discrimination told The Korea Herald they have never arbitrarily denied entry to anyone. 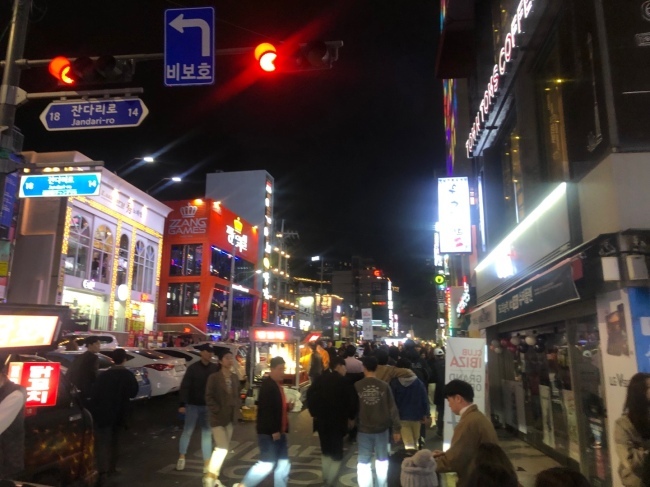 “Just as customers have the right to choose a club they want to enter, we also have the right to reject those who do not follow our rules and pose a threat to other customers,” said an official from a Hongdae club. Koreans’ responses to the suspected racism incidents were varied. Park Sue-jee, 30, said it was an excessive “generalization,” saying such an act constitutes racism. “I think it is socially unacceptable and also illogical. A few people of certain races could have caused trouble, but how does that mean all people of that race would cause trouble?” she said. On the other hand, a 29-year-old man, who asked not to be named, said private nightlife establishments had a right to pick and choose their customers. “The issue of discrimination against white people has not really been brought up because discrimination against those who have darker skin than Koreans has been much more severe,” said Park Kyung-tae, a sociology professor at Sungkonghoe University. “Racial discrimination in Korea stems from a lack of experience. It is not that the majority of Koreans are racist, but it is that they have low awareness of racism because they had not been exposed to different cultures and races,” he said. In a 2010-2014 World Values Survey, 44.2 percent of Koreans responded that they would not want foreign workers or immigrants as neighbors. A 2015 survey of 560 foreign residents in Gyeonggi Province showed 43.7 percent had experienced discrimination. Last year, the United Nations Committee on the Elimination of Racial Discrimination urged Korea, which joined the international Convention on the Elimination of All Forms of Racial Discrimination in 1978, to enact an anti-discrimination law to curb racism and xenophobia. Korea’s human rights watchdog is aware of the racism problem. “We are determined to bring about a change in the public perception (so that Koreans are aware that) discrimination based on race and hatred toward foreigners cannot be tolerated at all,” said Choi Young-ae, head of the NHRCK, in a statement marking the International Day for the Elimination of Racial Discrimination. The NHRCK plans to conduct a survey on discrimination against foreigners in the country, with the results likely to be made public early next year. A special committee to respond to hatred and discrimination was launched under the NHRCK in January. It aims to push for the enactment of an anti-discrimination law aimed at rooting out bigotry on such grounds as gender, disability, age, race, marital status and religion, which has remained deadlocked amid resistance from mostly Protestant groups opposing sexual minorities.